Magma Hotel in Superior, Arizona. Photo by M. Sfeir. 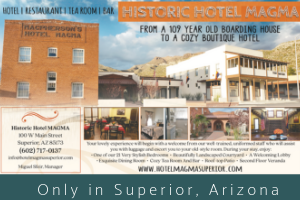 Offering all the accessories and lots of charm, the Magma Hotel in Superior is back in business! On the corner of Main Street and Magma Ave, the local landmark has been returned to her previous turn-of-the-century grandeur. With twenty-one guest rooms, a restaurant, tea room and bar, the little town of Superior can now proudly provide superior accommodation, as the town’s name would imply. 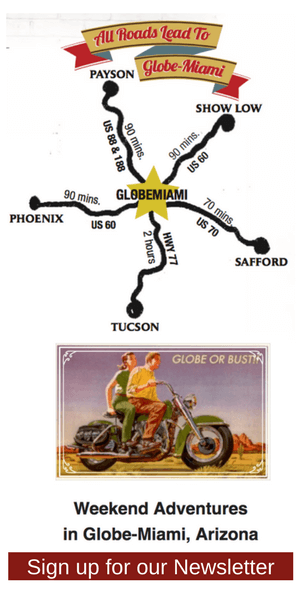 The Magma Hotel was first constructed in 1912, built from cement and steel. An adobe structure was added to that building in 1916, but it collapsed in 2006, before the restoration. Adjacent to the now demolished adobe, a third red brick building was added in 1923. The hotel was placed on the National Register of Historic Places in 1994, and owner and developer Miguel Sfeir has gone to great lengths to preserve the historic integrity of the two remaining buildings during the nearly six-year restoration. The restored lobby features a grand staircase which leads to the rooms. Courtesy Photo. “We are setting a standard here,” Sfeir says. Also called the McPherson Magma Hotel after the man who built it and whose name crowns the red brick building, the hotel was a thriving business when the copper mines were at their peak. Electric power had not yet reached rural Arizona in the early 1900s, but in 1917, the hotel installed the Delco Light Plant, providing electric lights with a gas run generator and batteries. Originally built as a hotel, the property has been used for many different purposes over the years: as a drug store, a beauty salon, a boarding house and even a Hollywood movie set. Bought and sold, and sold again, Sfeir is the first owner to seriously invest in the restoration of this historical local monument. The Magma Hotel property stood abandoned for decades. Photo by Lou Oates. Sfeir was born in Chile and came to the U.S. as a young man in the 80s. A philanthropist, motorcyclist, pilot, developer of popular lottery games, and well-traveled individual, Safeir has many interests and talents. He calls himself an “intruder” of architecture; in addition to restoring the Magma Hotel in Superior, he developed the Los Cedros Horse Breeding and Training facility in Scottsdale, a beautiful reproduction of Moroccan architecture and design, and he has designed emergency housing for displaced earthquake survivors. A hands-on perfectionist, Sfeir personally chose paint colors, furniture and fixtures for the Magma Hotel. A strong believer that service is critical in the hospitality business, he keeps a close watch on staff-training in the hotel and restaurant. The son of a Chilean diplomat, Safeir grew up in a household where courteous and gracious manners were paramount, and he is passing that awareness on to his staff. The tastefully decorated restaurant has French doors opening onto a courtyard for outdoor seating. Currently open for breakfast, the Magma Hotel will soon begin serving lunch and dinner. Sfeir plans on having theme nights that will incorporate a variety of food and culture. Mexican night might have a Mariachi band performing on the patio, and Italian night might include candles in Chianti bottles with Luciano Pavarotti singing opera in the background. It’s about more than food, it’s about the experience. The spacious tea room is wallpapered in vintage embossed English garden design and furnished with low tables and comfortable chairs. There is an antique wood buffet/bar on one side where you can buy a cup of tea (or glass of wine, if you’re so inclined). It’s a wonderful space to enjoy good conversation with friends or to open your laptop and work on a chapter to that novel you’re writing. If you want a livelier atmosphere, just cross the street to Barmacey, a bar and live music venue. Sfeir has restored this Main Street building, too, which opens in April. “I want to make this town a destination,” he says. Superior is on the up. Stunning views of Apache Leap, the quaint character of Main Street, great hiking, the Boyce Thompson Arboretum next door, and now the renovated Magma Hotel – there are so many good reasons to take the U.S. Route 60 to Superior and spend the night in this little old mining town in the Copper Corridor. Previous Got Dog Will Travel.